Jesus worked hard to make the world beautiful. He performed miracles, told fabulous stories - all for free - and generally spent his time spreading joy and light around the world. And worse - the miracles start to go wrong! Have some fun!' So Jesus had some fun - but was it worth it? 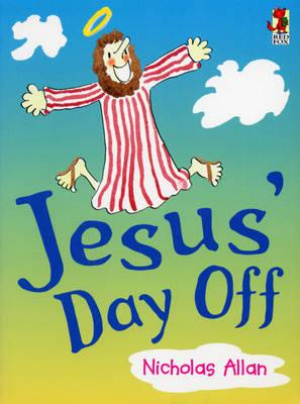 Jesus' Day Off by Nicholas Allan was published by Random House Children's Publishers Uk in June 2002 and is our 4736th best seller. The ISBN for Jesus' Day Off is 9780099262732. Be the first to review Jesus' Day Off! Got a question? No problem! Just click here to ask us about Jesus' Day Off.